We've been watching Shane Black movies all month in preparation for this: the first Marvel Cinematic Universe film set at Christmas. I'm reviewing the movie itself over at The Middle Room, but I had some thoughts that felt more at home here. While I'm grateful it lets me talk about the movie here, the holiday backdrop actually seemed a little superfluous to me. The setting was peppered with yuletide references, and there was no shortage of jokes reminding us when the events were occurring. But ultimately, I'm not sure what these accomplished (besides being good for a laugh). I guess there's a case to be made for tone, but I didn't feel the disconnect I got from Die Hard or melodramatic juxtaposition from Lethal Weapon. The fact it was set in winter allowed them to shoot Tony dragging his broken armor through the snow (in Tennessee - in December: something's off here), but not much else. If anything, it almost felt like the movie was set at Christmas to connect it with 80's and 90's action movies. Almost a signature. I actually got that sense a lot with Iron Man 3. The movie unleashes Shane Black by giving him nearly unlimited resources and toys, but at the same time superheroics doesn't really seem like a concept he's passionate about. 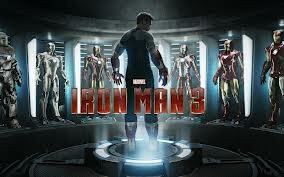 Right from the start, the movie finds ways of separating the iron from the man. Black doesn't seem to have much interest in playing with superheroes, but he clearly feels comfortable with over-the-top action sequences: he just needs his leads out of the suits. Normally this is the kind of thing that grates on me, but I have to admit the finished product was pretty cool. It helps that Iron Man, at his core, has always been more about Stark than the armor, so the move isn't entirely unprecedented. Still, it's notable that the final battle, despite including a dozen or so suits of armor, mainly had its leads running around with guns. Like its Christmas setting, the shift in focus felt like it was designed to bring Stark back to territory the director was familiar with. I can't really complain, since the result was a lot of fun. It's a little hard to take Iron Man 3 seriously as a Christmas movie, since the holiday elements feel more like a veneer than anything integral to the film. Still, they're definitely prevalent enough to qualify this. And forced or not, it's nice having a superhero movie to watch at the holidays alongside Batman Returns. In the end, it's a great action movie, up there with the best. And it's a nice addition to Marvel's lineup. But I'm still not clear on why it was set at at the holidays. And that's coming from someone who's in favor of damn near everything taking place at Christmas. I just checked the snowfall averages for December in Tennessee. Many towns in TN are at significant elevations, and have an average between 1" and 3". I'd say that this takes place during a particularly snowy December, but not to any unheard-of degree.